Nevertheless the Prime Minister has shown himself to be accident-prone both in utterances and decisions. His errors have had a cumulative effect. Abbott obviously follows the Putin formula - where foibles and missteps make Putin-Abbott more lovable to their publics. Strange Aye? And then there's the men of action, shock-jock, former violent sportsmen angle - Putin's godless judo and Abbott's Jesuit boxing. One of Abbott's failings is his falseness. He tries to be what he isn't, particularly during "photo opportunities". For these, he dons the appropriate garb of the site and pretends to participate in its routines, such as using hand tools on a production line, serving coffee, digging soil on agricultural properties, driving heavy plant such as trucks and earthmovers. All the while he exhibits his trademark foolish smirky grin. The falseness of his mannerisms flows to the falseness of his oratory, marking him as the probable inspiration for the writer of the ballad "Oh Yes - I'm The Great Pretender". Comrade Putin do same on factory floor or warzone as this Abbott. 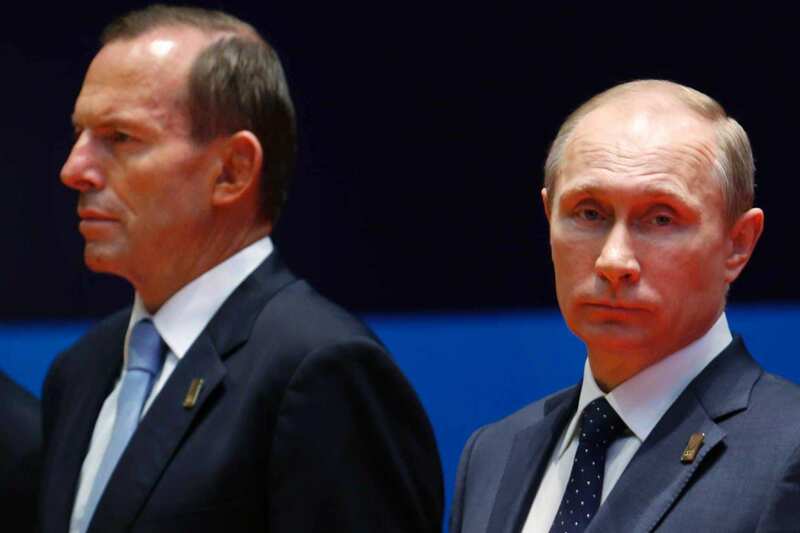 Even faces look same http://www.abc.net.au/news/linkableblob/5611804/data/tony-abbott-and-vladimir-putin-data.jpg . Well, that seems to be overstating the blindingly obvious Chas!? No uniform chasing, photo opportunity wasted http://www.abc.net.au/news/2015-04-10/tony-abbott-announces-acquisition-of-globemaster-aircraft/6384090 . Under Threat of Funding Cuts Australian Human Rights Commission, Legal Centers and the Public Interest Advocacy Center are refusing to represent clients to remove the Prime Ministers letters of decree. On May 10th 2010, a senior Centrelink official admitted the obvious, i.e. that Centrelink had never reported breaching triggered loss. 3 weeks later, the Employment Minister denied that post breaching terminal outcomes had ever occurred. I have 2 suppression orders issued by 2 Senate committees that bar me from distributing documents about these losses, including the refusal of the Federal Police to investigate these losses. Since losses occurred in event state and territory, the federal Police should have investigated in their own 'backyard', the ACT, but they have refused to do so and their letter is now confidential. Breaching legislation is inconsistent with the constitution; Paragraph 75 of the constitution is quite clear that breach of contract is a matter for the High Court, not Centrelink, to determine if a breach has occurred. Para' 51 (xxiia) of the constitution requires the gov't to pay benefits to those who need it. On 8th May 2013 a welfare recipient who had been prosecuted by Centrelink fought back and the high Court tossed out legislation that had no means. Some 15,000 prosecutions dating back to 2000 are now legally invalid. This means that by not paying them, welfare recipients will one day SUE and at the moment the legal liability is about $1 Trillion for the 'Breached Generation".